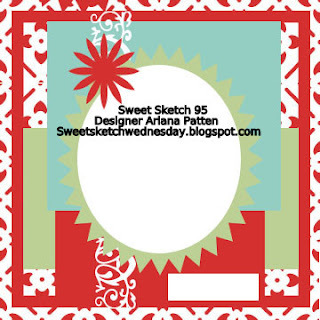 Sweet Sketch Wednesday has rolled around again. I am visiting Arlana and enjoying her craftroom. We had a fabulous day last Friday at the Scrapbook USA Expo. We both came home with a bundle of paper like we didn't even own a sheet! How is it that we can get so excited about paper? Have you ever wondered that? I also purchased some new nesties and embossing folders that you will see in the coming weeks! This week Arlana used the Nestie Deckled Oval. Go take a look...it is adorable! We hope you all had a fun week using Bunnies last week! We loved seeing your cards on SSW! 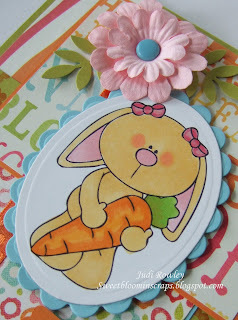 This week I have used another bunny from Stamp Fairy. She is called "Clementine - Carrots." I also used the Hoppy Easter sentiment which was a free download at Stamp Fairy. I inked the edge pink and added it to the SU Oval and Modern Label. I haven't used my stamps lately and wanted to create my own design on some paper so I stamped the little flowers on the Kiwi Kiss paper! if you are our winner. This is the sketch you will use this week to play along at SSW! Remember to comment on SSW so that you can have a chance for the Grand Prize! Wow Judi, I am really missing being up there with you and Arlana. I really like the deckled oval. Your little bunny is so cute. I really love the papers you have used. 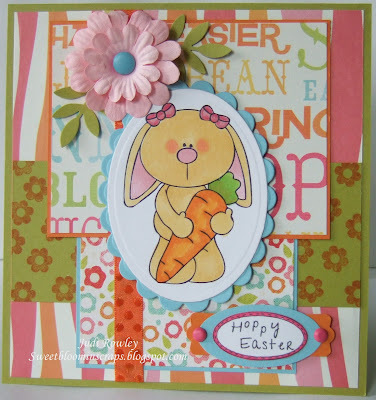 Such a bright happy Easter card! I will talk to you tonight. I've always considered Clem as "my girl" LOL. I just think she is so adorable! I love her cute pink cheeks and those flowers are so pretty! sucha cute bunny ~sweet card! It's funny how no matter how much paper we have, we act like we have none and have to buy more right? It's always fun to add new stuff to your stash! What an incredibly cute creation this week, your coloring is great and I love the brads. Did you say paper???!!!!! Don't own a sheet!! Yeah, right!!!!! How fun it must be shopping with you sister! And would you look at that adorable card!!!! Love, love, love your bunny and those papers!! Everything about this card screams sweetness!! Cute, Cute Cute!! Judi this card is just adorable!! teeheee, paper, ribbon and flowers are my down fall! A gal can never have too much paper! Glad you and Arlana had a good time at the expo, and I feel in love with the deckled ovals Arlana used, have to pick those up definitely! Judi your card is absolutely wonderful this week. I adore those incredible papers - did you get those with Arlana? How perfect Clementine looks with the papers too - you've colored her perfectly to match. This is a really great card!